In 2009 Transparency International Lithuanian Chapter started an initiative for media transparency called Breakfast of Journalists, which was the result of two studies conducted by TI Lithuania – Overview of Lithuanian, Latvian, and Swedish Media (2009) and Qualitative interviews with businessmen (asking about the experiences and views about media, 2007). The aim of Breakfast of Journalists is to introduce Lithuanian journalists and journalism students to the best practices used in foreign media and to promote discussions about professional ethics, transparency, and accountability in the journalist community. 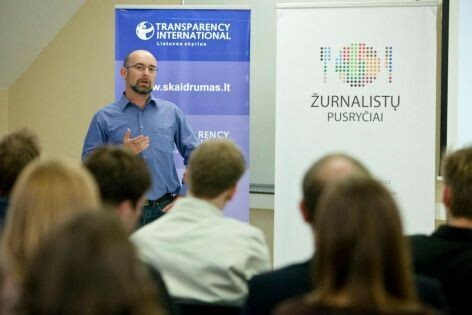 Since 2009, TI Lithuania has been organizing meetings, discussions, and seminars with media experts from abroad. In 2011 TI Lithuania organized 15 discussions with journalists and journalism students in Vilnius and Kaunas, as well as several training sessions, seminars and film viewings. In 2012 five discussions and eight intensive two day-long training sessions were organized. Breakfast of Journalists events were moderated by such distinguished foreign journalists as Vladimir Pozner (Novaya Gazeta), Anatoly Verbin (previously – Reuters journalist), Toby Murcott (BBC), Aidan White (previously – manager of International Federation of Journalists ), Attila Mong (representative of investigative media from Hungary, the author of radio initiative Minute of Silence), Henrik Kaufholz (Politiken, Denmark), Diane Kemp (BBC, University of Birmingham), Gavin MacFadyen (Centre of Investigative Journalism, UK) and others. For more information on upcoming events, join our Facebook page: http://www.facebook.com/zpusryciai?fref=ts.